The play "Kanadehon Chûshingura" was originally written for the puppet theater (Bunraku) and staged for the first time in the 8th lunar month of 1748 in Ôsaka at the Takemotoza. It was adapted for Kabuki the same year and staged for the first time in the 12th lunar month of 1748 in Ôsaka at the Kado no Shibai [casting]. The "Sandanme" act (third act) was performed with the actors Ichimura Mihoemon, Yamamoto Koheiji and Ichinokawa Hikoshirô II in the roles of Moronô, Momonoi Wakasanosuke and Hen'ya Hangan. 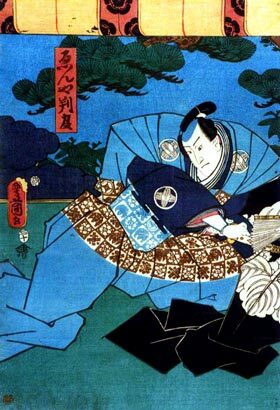 The "Sandanme" act, the third act of "Kanadehon Chûshingura", is made up of three scenes commonly called "Shinmotsu" (literally "Presenting the Bribes"), "Ninjô" (literally "The Attack") and "Uramon" (literally "At the Back Gate"). Scene 1 and 2 are always performed for a tôshi kyôgen production of this drama and are never staged independently of the others acts. The "Uramon" scene, which is about the couple Kanpei/Okaru, is usually omitted (except for some tôshi kyôgen performances in the Kamigata style) and replaced by the michiyuki "Ochiudo". We come to one of the play's truly great scenes. It's set within Tadayoshi's mansion in an ante-room sumptuously decorated with a pine tree motifon the gold sliding doors and for this reason it is often called simply the "pine room scene". It's some moments after the events we saw last and Moronô, Bannai and Honzô have now made their way to this room. As they enter they're surprised to see Wakasanosuke waiting for them, still furious at Moronô and prepared for a fight. He does not see Honzô and nor does he know what Honzô has done to assuage Moronô's anger. To Wakasanosuke's astonishment, Moronô is humble and apologetic, and his ingratiating words force Wakasanosuke to give up any idea of revenge. In complete contrast to his previous behaviour Moronô now praises the young lord for his early arrival and his diligence in performing hisdut ies. He seems overly anxious to appease Wakasanosuke's violent mood and thereare so me very amusing moments when Moronô even offers to have Bannai massage hisback when Wakasanosuke claims to feel out of sorts. Wakasanosuke can do nothing but swallow his fury and withdraw, screaming one final insult at Moronô as he leaves. After realizing that he and Bannai are alone Moronô's real feelings naturally reveal themselves. He never meant a word of what he said and despises Wakasanosuke as much as ever, but having taken Honzô's gifts he had to pretend otherwise. This has left Moronô in a filthy mood and when Enya Hangan appears soon after, Moronô scolds him for being late. As yet Moronô holds no particular grudge against Hangan and the entire tragedy of "Chûshingura" might have been averted if only the following incident hadn't occured. A letter arrives from Hangan's wife, Kaoyo, addressed to Moronô. The latter thinks it is a favourable reply to his previous advances and his mood somewhat recovers until he actually reads the note. It is an ancient poem from the "Shin Kokinshû" collection with which Kaoyo means to reject Moronô. When he realizes this he is both furious and embarassed for he feels sure that Kaoyo must have told Hangan as well. When asked if he's seen the poem Hangan replies that he has not, but this is not enough to prevent the onslaught of insults which now come from Moronô. The core of what follows is bitter sarcasm which Moronô takes to its furthest extreme andwhich pushes the normally placid and sensible Hangan beyond endurance. Moronô extols the beauty of both Kaoyo's handwriting and her person, saying that it's no wonder Hangan himself was late in coming to the mansion today... he was probably at home enjoying himself and getting drunk with his wife. But Moronô's sadistic streak really shows itself when he starts to belittle Hangan by comparing him to a fish which is suddenly let free from its tiny well into a broad river. He is just like that fish for he has come from his tiny mansion into this magnificent big one. Though at first merely confused as to why Moronô should suddenly be insulting him, gradually Hangan feels pushed more and more into defending his name. By the end, he has no choice but to unsheath his sword and slash at Moronô, despite the fact that such action is forbidden and punishable by death. His honour as a warrior demands that Moronô die for his gross insults, even at the expense of his own life. 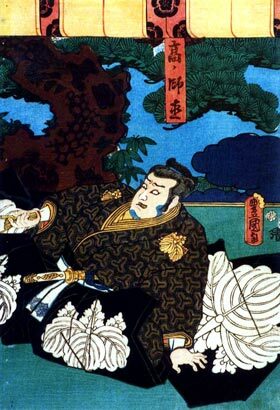 However, tragically, Honzô rushes out just then to hold Hangan back and prevents him from killing Moronô, and the senior lord escapes with only a minor cut to his forehead.